When you’re vacationing with little ones, it’s important to find a place that will provide entertainment and fun for the kids but relaxation for adults. Across Mississippi, you’ll find hotels and resorts designed to help the parents unwind and occupy the kiddos with everything from water parks to playgrounds. Here are the 10 best family-friendly hotels and resorts in the state! Margaritaville in Biloxi was specifically designed to be a family-friendly destination in the middle of casino-heavy Biloxi. Kids will love the 55,000-square-foot arcade, and everyone will enjoy splashing the day away at the rooftop water playground. Pearl River Resort is a fun spot in the heart of Mississippi which offers two separate hotels and a variety of nearby activities. You'll definitely want to take the family to nearby Geyser Falls, the largest water park in the state. Other attractions in the area include Lake Pushmataha and the Chahta Immi Cultural Center, which showcases information about the Choctaw Indians. Vicksburg is one of Mississippi's most historic and beautiful cities. Give children the opportunity to learn about life on the Mississippi with a visit to the Hampton Inn, which is located adjacent to the Vicksburg National Military Park. You'll also want to take a trip downtown to view the historic mansions and to tour the Coca Cola Museum. Taking the kids to a casino might seem like an unusual trip, but you have to see the Hollywood Casino to believe it. Book a room in the five-story tower, then take the kids to tour the Hollywood-themed decor, including wax figures from “The Addams Family,” a replica of the DeLorean from “Back to the Future,” and everyone's favorite: the Batmobile! Lake Tiak-O'Khata is a family-owned vacation destination in beautiful Louisville. The resort includes a full-service restaurant, a variety of accommodations, including kitchenettes and waterfront cabins, and beautiful views that everyone will enjoy. In addition, the lakeside resort includes a swimming area, boat rentals, water slides, and plenty of spaces to play. If you're looking for a fun family beach vacation, consider the South Beach Biloxi Hotel. It's the only hotel in the area that's located directly on the beach, and the pool overlooks the waters of the Gulf of Mexico. The modern Art Deco design will make for great family photos, and the beach resort is located near a number of fun activities. The Hilton Garden Inn in Jackson is one of the most family-friendly destinations in Central Mississippi. The accommodations are spacious and comfortable, and with three restaurants and a courtyard pool with cabanas, you might not want to leave the hotel at all. 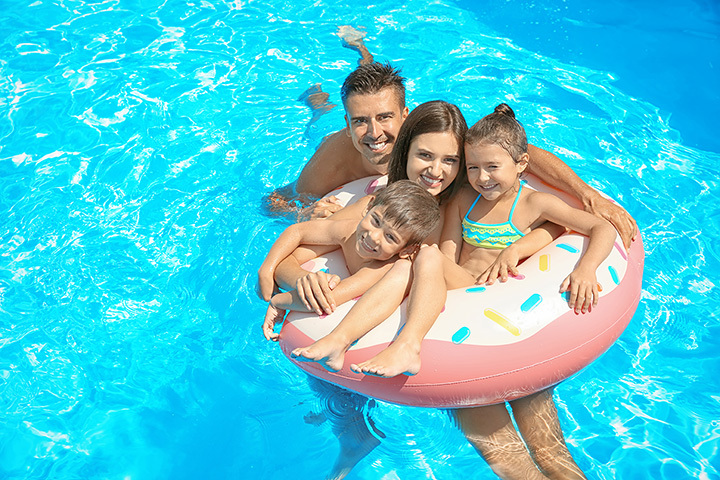 However, nearby attractions such as the Children's Museum will make it worth a day out of the pool. At Chotard Landing Resort, the whole family will enjoy a beautiful outdoor experience while still having access to all of the relaxation you expect from a luxurious vacation. Chotard Landing Resort has cabins and condominiums available, each of which comes with a variety of amenities, including several with a full kitchen. Home2 Suites by Hilton is a new luxury destination in one of Mississippi's fastest-growing areas. DeSoto County has plenty to do for the whole family, from shopping and theaters to world-class dining. In addition, you'll be just 20 minutes away from downtown Memphis! Yogi on the Lake in Pelahatchie is the perfect spot for a nature-filled retreat for the whole family. The destination includes lodging, campsites, a combination splash pad and playground, mini golf, and more. The park is also a short drive from the Bienville National Forest, Ross Barnett Reservoir, and the greater Jackson area.